Pelican Bomb Gallery X is closed Friday, February 9–Wednesday, February 14, for Mardi Gras. 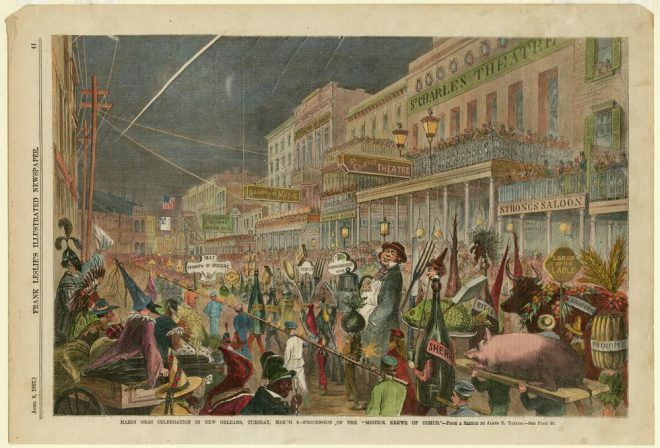 JAMES EARL TAYLOR, MARDI GRAS CELEBRATION IN NEW ORLEANS…, APRIL 6, 1867. WOOD ENGRAVING WITH WATERCOLOR FROM FRANK LESLIE’S ILLUSTRATED NEWSPAPER. COURTESY THE HISTORIC NEW ORLEANS COLLECTION. For Mardi Gras, Pelican Bomb Gallery X is closed Friday, February 9–Wednesday, February 14. We’ll reopen with regular gallery hours on Thursday, February 15. “Queer Tropics” is on view through February 25.